Under Japanese rules its a seki. See Example of a seki with 1 (false) eye in total. Pretend it's black's turn to move first in this position. Does black have a useful move to capture the white stones? Now pretend it's white's turn to move first in this position. Does white have a useful move to capture the black stones? If the answer to both of these questions is "no", then it's a seki. 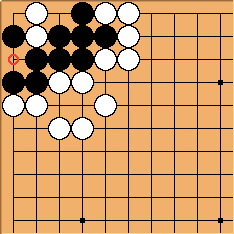 Under Chinese rules and Ing rules it is also seki, but unlike under Japanese rules Black receives one point for the empty circled intersection in addition to the points received for Black stones on the board at the end of the game. Anonymous: Under AGA rules, which are more or less equivalent to Chinese rules, black can secure a point out of this position by playing the circled point as the last move (after filling all dame). This is because passing costs a point, and by waiting until the very end black can force white to pass an additional time. Either black fills the last dame and the sequence is wPass,fill,wPass,bPass,wPass, or white fills the last dame and the sequence is fill, wPass, bPass,wPass, either way Black makes one more point than passing immediately. In general to get the best AGA result you fill all false eyes and whittle your own real eye down to a single point (if you have a real eye), and fill all common liberties but 1 for eye-vs-eye seki and fill all common liberties but 2 for noeye-vs-noeye seki. Filling the common liberties needs to happen first, as these are normal dame. Herman: This is not true, by filling the false eye Black will kill his own group. Positions do exist where filling false eyes in seki is a way to get points for them under AGA rules, but this is not one of them.